Recently, we were honored to be nominated for DERMASCOPE Magazine‘s 2018 Aestheticians’ Choice Awards for Aromatherapy in the Body Care category. 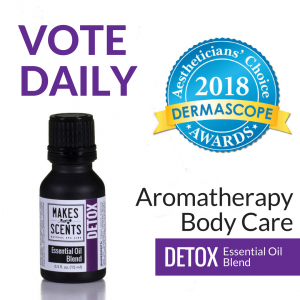 Click the link below and VOTE DAILY for our Detox Essential Oil Blend and help us become one of the 2018 Aestheticians’ Choice Awards winners! Once you click the link, select “Body,” select Detox Essential Oil Blend (at the top of the page), scroll down and click “Finish.” As always, thank you for your support!